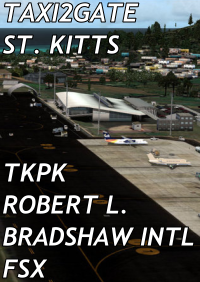 Robert L. Bradshaw International Airport (IATA: SKB, ICAO: TKPK) is an international airport located just northeast of Basseterre, on the island of Saint Kitts, serving the nation of Saint Kitts and Nevis. 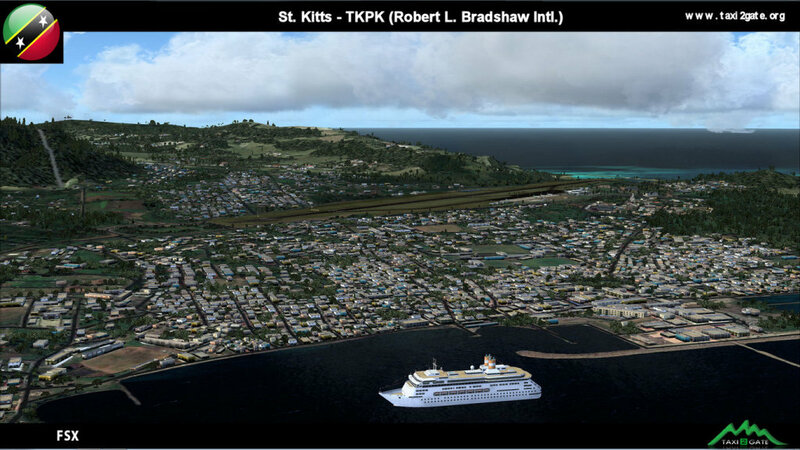 It was named after the first Premier of St. Kitts-Nevis-Anguilla (as it then was), Robert Llewellyn Bradshaw. A major renovation was completed in December 2006. 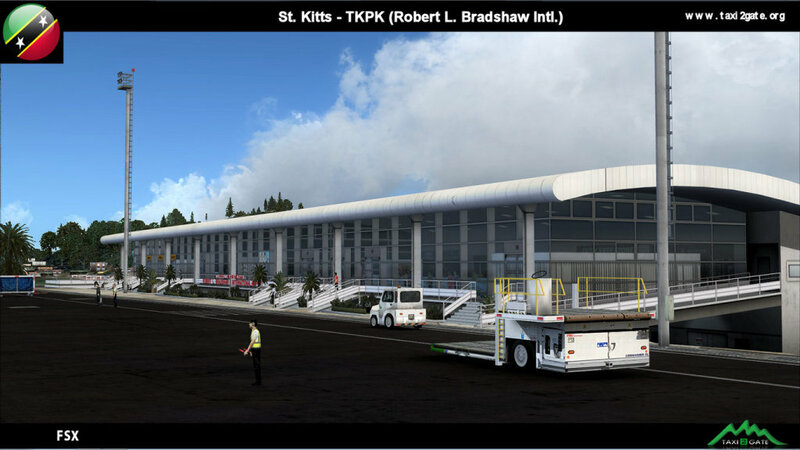 The US$17 million project financed by loans from the St. Kitts-Nevis-Anguilla National Bank and Taiwan, includes expansion of the parking apron to accommodate six-wide-bodied aircraft at the same time, complete resurfacing of the 2,439 m (8,002 ft) runway and construction of a new taxi-way. Construction started late 2004. Up to 6 wide bodied jets can now be accommodated on the tarmac. 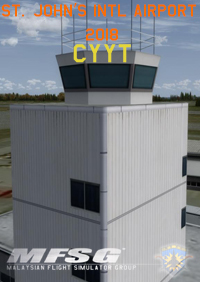 The airport can accommodate commercial jumbo jets and handles scheduled non-stop jet flights to Canada and the United States, as well as numerous regional commuter flights from within the Caribbean area. The largest aircraft now operating regularly scheduled service at SKB is the Boeing 777-200 from British Airways. 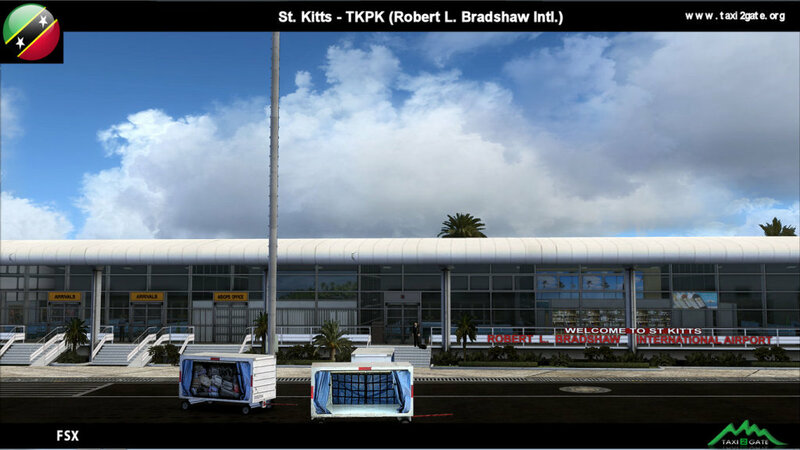 The airport also provides facilities for cargo and private jets. The largest aircraft ever to land here was a Boeing 747-400. A chartered Sri Lankan Airlines Airbus A340-300 made aviation history when they did a charter flight to St Kitts in 2011, a nearly 10,000-mile journey from Colombo-BIA, Sri Lanka.  In 2008, the airport handled 399,706 passengers. O que dizer deste cenário, fantástico, incrível FPS nas alturas. Taxi2Gate, voces estão de parabéns mais uma vez. Nota 10. I've been disappointed with T2G's latest two offerings, Doha and this airport. 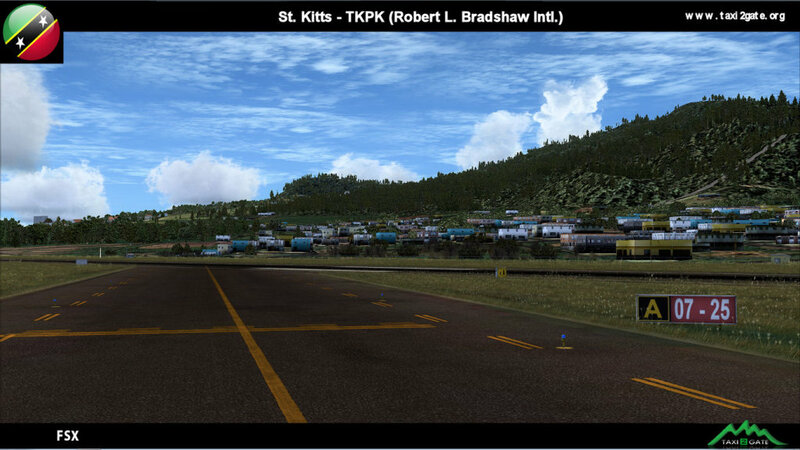 For some reason, they've regressed to making airports that do not work with aircraft shadows enabled. As an AI enthusiast I consider this a bare minimum. 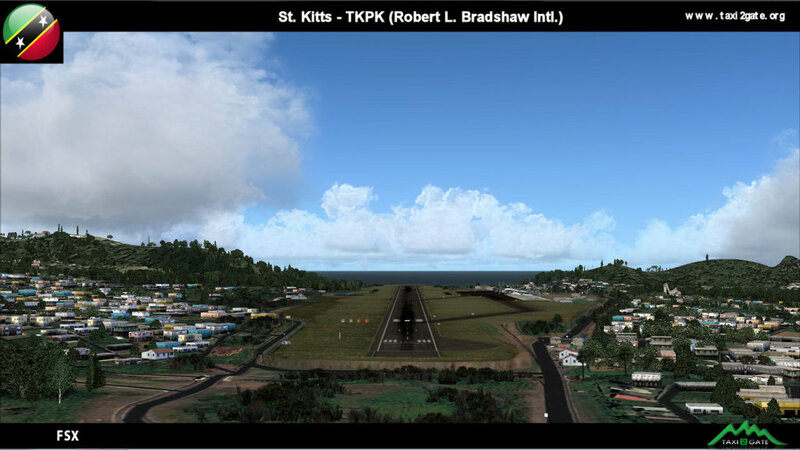 Their previous airports like LTBA and KMCO never had issues with showing aircraft shadows, and are must-buys. These for some reason, do, which sadly is gonna draw me away from their products in the future. Nothing worse than seeing aircraft with no shadows, looking like they are hovering above the ground. The airport itself is OK, but there are a few things that get to me. 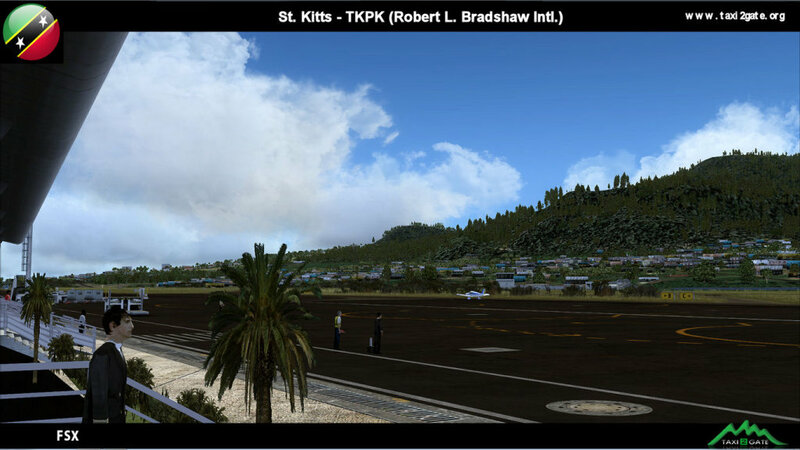 Such a small airport should normally see relatively good performance, but I'm seeing fairly low FPS figures for this type of add-on. 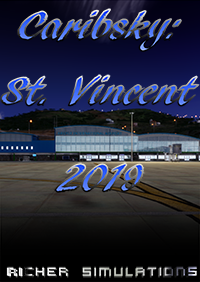 I won't give numbers as it is highly subjective, but I'm getting similar FPS that I get in much bigger airports with loads of AI. I know they modeled a big chunk of the city, but it still should not be this resource hungry. The textures are very good in the immediate airport area, but I find the green used in the surrounding city grass areas a bit strange. It does not match my FTX Global textures very well, and I'm pretty sure it would kind of stick out a bit with default as well. It almost looks like artificial grass if you know what I mean. I find it hard to believe developers would release products today that do not at least offer an option to match FTX Global. One other issue that stood out is the 3D grass on the sides of the runway. Maybe because the grass texture is too light, they seem to stick out like a sore thumb. Looks fine from the ground, but looks not that great from overhead. 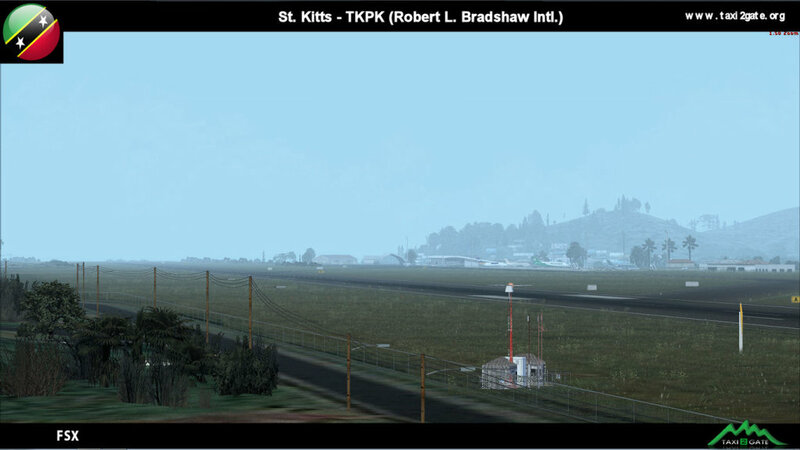 For some reason, their previous Caribbean airport, TVSV, did not suffer from this issue, and it also uses lots of 3D grass. 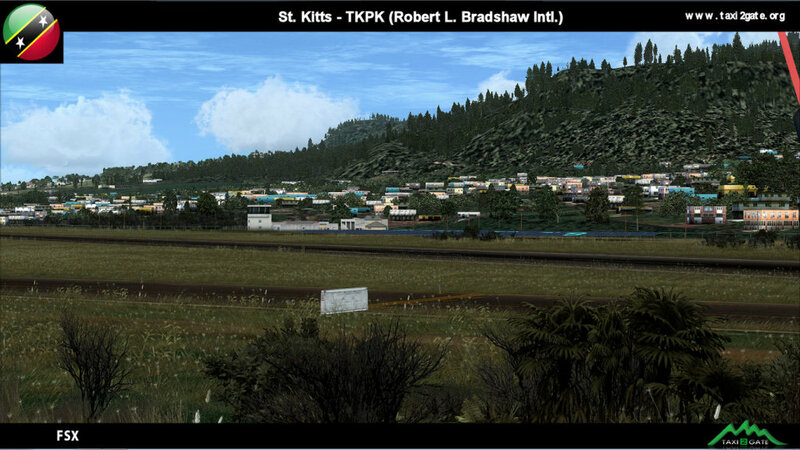 I was a bit surprised to not see the shoreline right before runway 25 enhanced even one bit. You fly right over this shore as you land, and it is plain default. Seems like a pretty important feature to leave out since it is a very thin strip of land. Anyway, with these issues I could only give this 3 stars. I hope T2G can get back to the level I saw in their previous add-ons. I've been disappointed with T2G's latest two offerings, Doha and this airport. 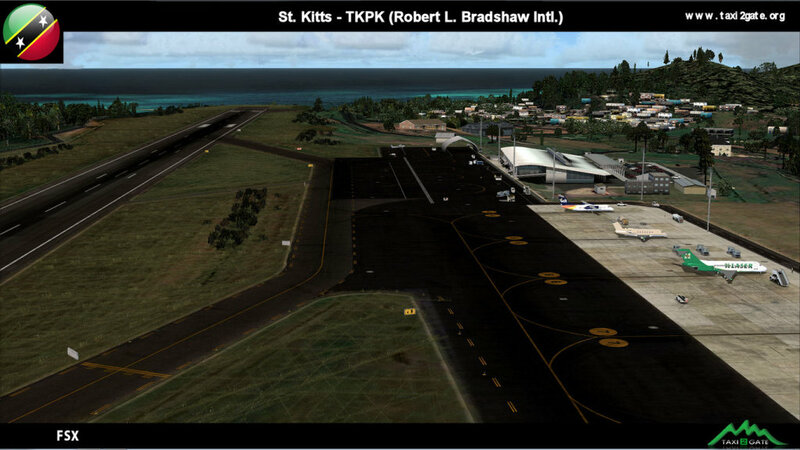 For some reason, they've regressed to making airports that do not work with aircraft shadows enabled. As an AI enthusiast I consider this a bare minimum. 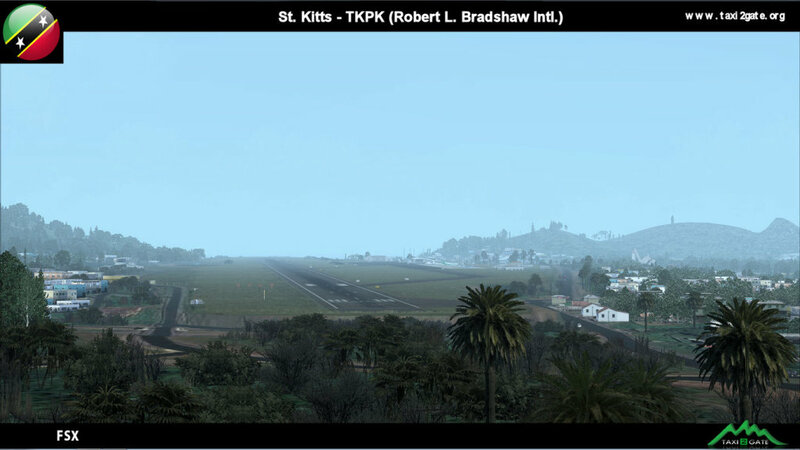 Their previous airports like LTBA and KMCO never had issues with showing aircraft shadows, and are must-buys. These for some reason, do, which sadly is gonna draw me away from their products in the future. Nothing worse than seeing aircraft with no shadows, looking like they are hovering above the ground. The airport itself is OK, but there are a few things that get to me. 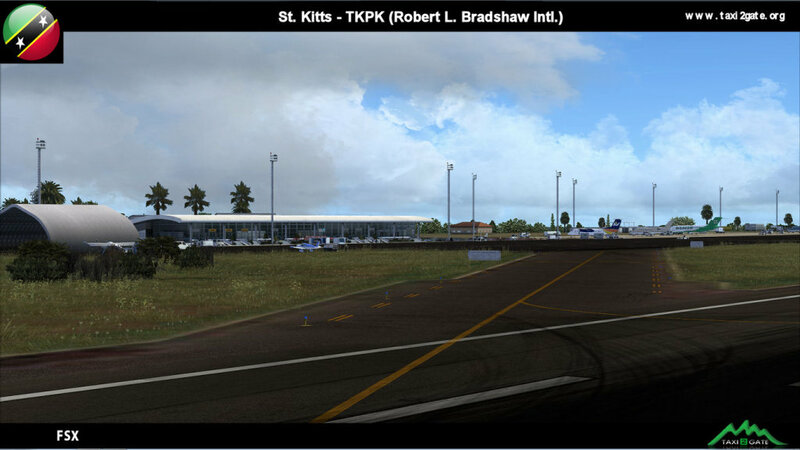 Such a small airport should normally see relatively good performance, but I'm seeing fairly low FPS figures for this type of add-on. 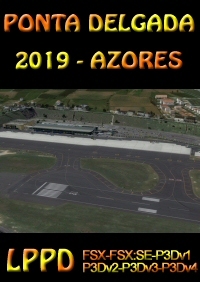 I won't give numbers as it is highly subjective, but I'm getting similar FPS that I get in much bigger airports with loads of AI. I know they modeled a big chunk of the city, but it still should not be this resource hungry. The textures are very good in the immediate airport area, but I find the green used in the surrounding city grass areas a bit strange. It does not match my FTX Global textures very well, and I'm pretty sure it would kind of stick out a bit with default as well. It almost looks like artificial grass if you know what I mean. I find it hard to believe developers would release products today that do not at least offer an option to match FTX Global. One other issue that stood out is the 3D grass on the sides of the runway. Maybe because the grass texture is too light, they seem to stick out like a sore thumb. Looks fine from the ground, but looks not that great from overhead. 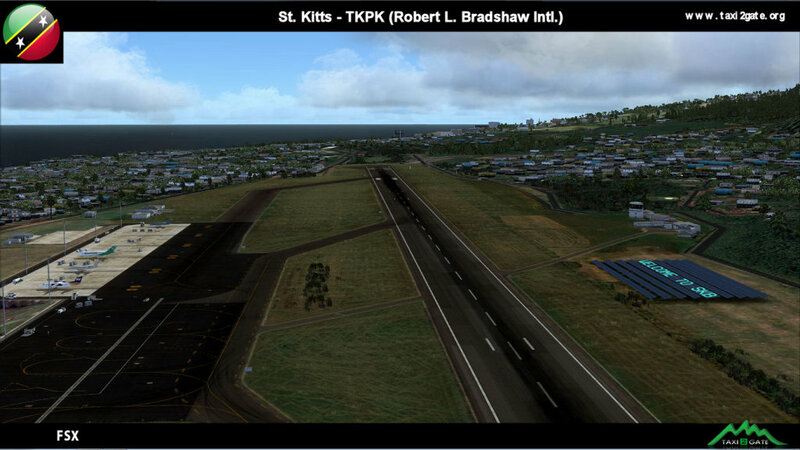 For some reason, their previous Caribbean airport, TVSV, did not suffer from this issue, and it also uses lots of 3D grass. 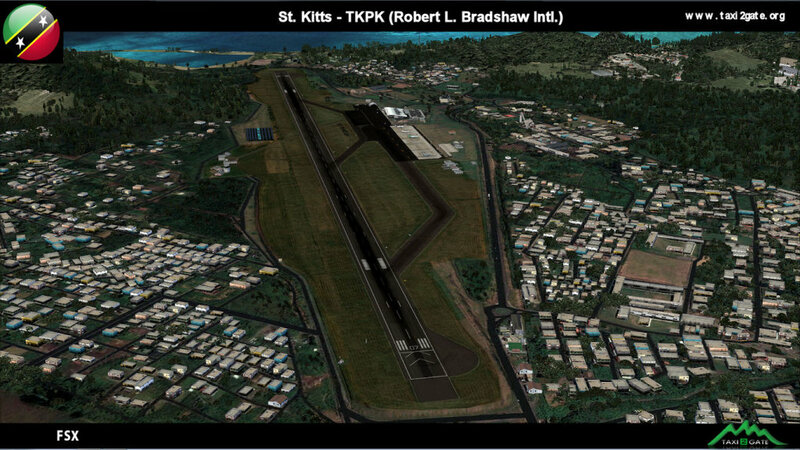 I was a bit surprised to not see the shoreline right before runway 25 enhanced even one bit. You fly right over this shore as you land, and it is plain default. Seems like a pretty important feature to leave out since it is a very thin strip of land. Anyway, with these issues I could only give this 3 stars. I hope T2G can get back to the level I saw in their previous add-ons.